Hereford United chairman David Keyte has dismissed suggestions that the club might prefer to fold and reform further down the non-league pyramid. The Bulls face a winding-up petition in the Royal Courts of Justice in London on 7 April over an unpaid £78,000 PAYE tax demand from Revenue and Customs. Keyte told BBC Midlands Today: "None of us are working towards a revamped phoenix club. It's not on our agenda." Hereford are 20th in the Conference Premier, a point above the drop zone. Bulls fans have so far raised £20,000 in their bid to reach that initial £78,000 target. Further donations have been promised, along with a £3,000 contribution from the Hereford United Independent Supporters' Association and £2,000 from the club's other main fan body, the Hereford United Supporters' Trust. Local supermarkets are holding bucket collections and stand-up comic Omid Djalili is scheduled to appear in a hastily-arranged 'Comedy To Save The Bulls' event in the city on Sunday, which is expected will raise a further £10,000 after selling out in less than 24 hours. Keyte has hinted that there might yet be a rescue bid from potential new investors. And, working on average gates this season of just 1,703, a figure swelled by Saturday's massively-improved crowd of 2,545 for the home date with Grimsby Town, the club are losing money by the week. They are overall attracting considerably less than the 2,000 break-even figure for home gates outlined by Keyte, and he has already warned that they need £300,000 to see out the current season. Keyte admitted some months ago that he had already pumped more than £600,000 of his own money into the club since taking over as chairman in the wake of Graham Turner's departure in June 2010. "I had a figure in my mind that I was prepared to put into the club," Keyte added. "But what I've not been able to account for is not being able to walk away from it. "In four years I've gone past it and double." 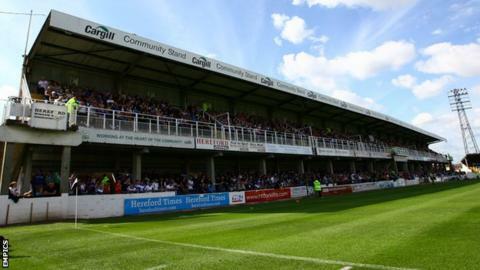 Hereford do have long-term plans to raise money by the commercial redevelopment of both ends of their council-owned ground at Edgar Street, but they have been told that they cannot expect direct financial assistance from the local authority. "We can't offer cash," Herefordshire Council leader Tony Johnson told BBC Midlands Today. "But we can offer help, advice, terms of lease, negotiations on rent and we're doing all of those things, and anything else that doesn't involve direct cash we'd be happy to talk about."